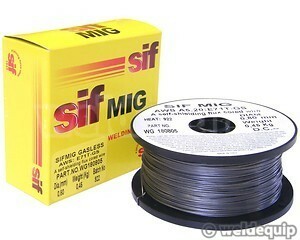 Gasless mild steel MIG wire from Sifbronze. SifMig Gasless is an excellent quality self-shielding wire that feeds reliably and gives consistent results. The 100mm spool diameter with 15mm hole centre will fit most types of hobby MIG machine. Gasless wire runs on a different polarity than standard, gas-shielded wire so can only be used on machines with a polarity reversal feature (set to torch negative). Self-shielding gasless wire produces considerably more fumes than standard wires so ensure adequate ventilation and welding fume protection.